You don't want to feel like you're being interrogated in the bedroom. Super bright lights don't set the mood, nor are they useful for helping you to relax. But, you may need bright lights for function if you don't have a space that gets a lot of natural light. The answer: a dimmer. Reading lights you can place on nightstands are also key for adding function and style without blasting the whole room with light. Fire-engine red walls will create energy, which could be helpful to your love life, but might keep you up at night for all the wrong reasons, too. Use the principles of Feng Shui to choose colors that will help "bring the best energy into your space," said MyDomaine. According to certified Feng Shui expert Laura Cerrano, earth tones, beige, and cream are "ideal for someone looking to create a restful bedroom," while colors like blue, blue-green, and black "can translate into a deeper connection between you and your partner." A headboard isn't just a finishing touch to the room. It's an essential part of the space that gives it a well-put-together, finished look and that also make the bed feel plush. "An attractive headboard will really make a statement in your bedroom and transform the space," said Houzz. "It will also make your bed a much more comfortable place to be. When choosing a headboard, think about the size of your room and the height of the ceiling to get the proportions right. 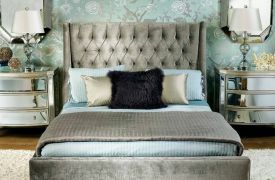 If you have a really high ceiling, you can afford to scale the headboard accordingly to create a real impact." Older PostAre Barn Doors Here To Stay?